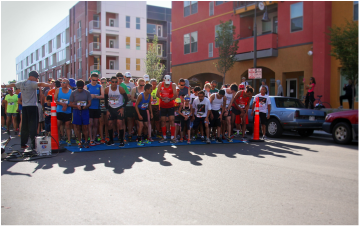 The race starts in front of the Buckhorn Exchange at the corner of 10th and Osage in Denver. The course winds through the historic La Alma/Lincoln Park area, crossing out and back on the 8th Avenue Bridge. This race is run on a USA TF certified course. Awards will be given to 1st, 2nd, and 3rd place male and female finishers in each age division. Packet Pickup & Registration 7:30 – 8:45 a.m.